"We want to help our clients be successful." Don't you wish that was the motto of every vendor that you work with? From 1980, when Einstein Printing first opened in Dallas, this has been our goal. Of course, we want to be successful as a business, and we realize the best way to achieve this goal is to help our clients become successful. In order to do this, we have had to make changes and adjustments along the way. 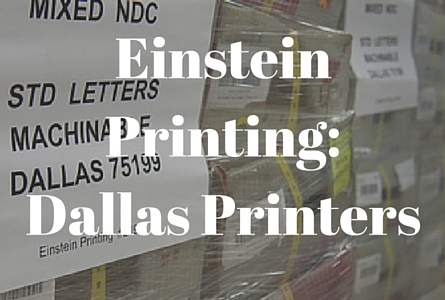 From the original quick print shop, Einstein Printing has grown to be a premier Dallas commercial printer. Some people today think that they can do their own printing with their inkjet or laser printers, and maybe a few people can. However, just one mailing of amateur looking brochures can cost you more than you can ever hope to save by doing your own mailers. You have seen these do-it-yourself print jobs. They are pretty easy to recognize. Some are not centered properly on the page, the ink may be fading, there are possible misspellings. The list can go on and on. What does this say? It says, "I don't really care enough about my business to make sure it is professionally represented." Your business card, banner, or mailer may be the first thing your prospective customer ever sees of your business. Make that first impression count. Make sure it says "We are a professional group of people. We care about our business. We will care about you." When you hire Einstein Printing, a Dallas commercial printer, you can be sure that all of your printed products will be professionally done. Dallas Printing Services - Professionally printed business cards, letterhead, catalogs and brochures from this Dallas printing company. Dallas Commercial Copying Services - Let Einstein Printing copy your training manuals, reports, and presentations. Dallas Banner Printing - Work with one of Einstein Printing's professional employees to create the perfect banner for your business. Vehicle Graphics - Advertise everywhere you go with vehicle wraps, vehicle graphics and vehicle magnets. Dallas Mailing Services/Direct Mail - Increase response rates by adding personalized text to Every Door Direct Mail. We can show you how. Dallas Promotional Products - Leave a reminder of your business with your customer by giving them a coffee mug, pen, thumb drive, or other promotional products with your logo, name and phone number. Dallas Signs and Display Printing - Let our professionals create attention-grabbing yard signs, posters or banners for your business. Dallas Creative Services - Develop your brand. We have specialists in design to help you design your logo, and your corporate identity package. Which of these Dallas printing services do you need for your company? Call us at 972-776-2244 to discuss your printing needs with an Einstein professional. If you are just getting started, and you are not sure what your needs are, or you don't even have a logo yet, that is no problem. We can help you from the conception of your business by helping you design the logo, brochures, letterhead, mail campaigns, and promotional products. We will also provide you with a free quote in advance of starting the work. 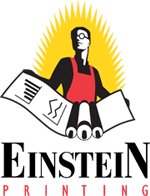 Call Einstein Printing at 972-776-2244 or request an estimate today!